PARENTS YOU MIGHT BE GOING THROUGH THIS SITUATION RIGHT NOW WITH YOUR TEEN. You’re almost done your Christmas shopping when your teen comes to you and mentions that her friends decided to have a Christmas gift exchange. There is only one problem, she has no money. It’s easy to say no you can’t shop because you have no money but that doesn’t solve the problem because no alternatives were offered for your teen to earn money. One of my CBB fans is going through this problem with her teen and needs parenting advice. Christmas shopping is fun for just about anyone who plans on giving during the holidays whether gifts are bought online, the mall, downtown shops, small business owners or even at bazaars and craft shows. For some Christmas has turned into a huge consumer money grabbing spree but for the kids it will always be something they look forward to. Not all children participate in Christmas as it depends on the parents but for those that do your child at some point will want to buy their own gifts. Once your teen understands that giving is more important than receiving you may find that they too want to start giving. The only catch is, you don’t want to pay for their Christmas shopping because that’s not teaching them financial responsibility. There’s nothing wrong with buying gifts and going Christmas shopping as long as you have a budget and have saved the money to pay cash for your purchases. Over the course of the year there are many jobs to get your teen in the savings spirit that will earn them some money. If the want to go Christmas shopping pops up a month or two before Christmas there may be some ways your kid can earn some cash fast so they can buy small gifts for friends and family. Most often you will find kids of all ages with limited funds Christmas shopping at the Dollar store, second-hand shops, hand-made shops or they might buy products to make their own gifts. Either way they need money to do this and they should be earning it so they know that money doesn’t grow on trees, including Christmas trees. Our 13-year-old daughter came to me the other day a month before Christmas to tell me that she wants to buy gifts for her friends and for her dad and myself. They decided to buy each other something small for Christmas and plan on a Christmas shopping trip in the next few weeks. They’ve already started creating their Christmas gift list and most items are fairly cheap but still cost money. My question is how do I encourage my daughter to earn the money she needs to buy these gifts instead of me just handing the money over to her. I don’t want to start a yearly trend where she comes to me for money to go Christmas shopping. With only a month before Christmas there must be some ways for her to earn some cash so I was hoping you or your fans might have some ideas for me to suggest to her? If your fans have gone this route do they have any suggestions on how to approach the situation without her getting upset? This time of year there are craft sales, bazaars held at local churches and other community centres in just about every city and town. If your teen has the knack for crafts or can create something unique to sell then encourage them to become an entrepreneur. A friend of ours who knits taught her 14-year-old how to knit as well and now she knits hats and scarves then sells them to friends, family and on Facebook for profit. Hand-made gifts are always personal and enjoyable especially if they are cozy. Depending on the age of your teen they might be ready for their first job. Have them fill out applications and submit them online or bring them into shops in the mall. If they haven’t created a resume yet work with your teen to build a resume or find someone who can help. Many stores hire Christmas help or part-time help throughout the year and ask for a resume from applicants. This is a great way for your teen to save up money for Christmas gifts and for their future expenses. How old do you have to be to work in Ontario? There are many rules in the workplace for Ontario with the first one being the minimum age requirement to hire an employee. If your teen plans on finding their first job keep in mind the provisions set out in Ontario for employment. Stores, Offices or Arenas: 14 years. In a restaurant, the food preparation area would be considered a factory, with a minimum age of 15 years, whereas the cash register would be a shop – minimum age: 14 years. Special programs for young workers are described in a section of the ministry’s web site devoted to issues of concern to students and young workers. I think just about every teen babysits at one point because they are passionate about earning money and becoming independent. Someone is relying on them to watch their children and they are getting paid to do so. That’s a big deal for many teens. Babysitting is always a great starting point for teens to learn financial responsibility. Once your child has finished your local babysitters course they will be in demand. Last week while I was out for a walk with my nephew and son we ran into the local paper boy pushing his grocery cart filled with the weekly flyers. Our son poked his head inside the cart and asked me, “What is that, dada?” to which I responded, a newspaper route. You’ll be doing the same thing one day son to earn money like I did when I was young. He then became more interested in the tires then listening to me. Even though he might not understand what I say I still communicate with him like I would if he were older. A paper route might only earn a child $20 a week but that’s a start and the perfect opportunity to save money and learn about responsibility. If your teen completes chores then pay them according to what you both agreed on if there was a monetary exchange to happen. When you tell your teen that they will be $10 a week for allowance make sure you pay them in full. A great suggestion would be to open a bank savings account and deposit the money for them. Let them watch their money grow for whatever they need down the road. Come December when they want to go Christmas shopping they will have money saved up to do so. We have a teen on our street who walks dogs for a few of our neighbours and house sits pets when they go away on vacation. She does this when we are not able to help them out and they pay her a daily fee. She will walk their dog around the block in the morning, afternoon and evenings during the week and weekends. Once inside the house she refreshes the water bowls, sets out food and cleans kitty litter for their cat too. If you want to get the word out fast you can post signs on mailboxes, talk to your neighbourhood community leader or post an ad online targeting your neighbourhood. This also gives your kid an opportunity to see what it is like to exclusively take care of a pet for that time when they come to you saying they want a cat or dog. I’m always on Kijiji looking for things to buy whether it be for personal or resale reasons. Without fail every holiday season I find some ads with toys for sale by children. The parents run the ad and say that they child wants to sell their stuff so they can buy Christmas gifts. Encourage your teen to go through all of their books, toys, sporting equipment and anything else they don’t use and sell it online or at a garage sale. During the winter you could host a garage sale inside the garage as opposed to outside in the summer or an online garage sale. This practice will help encourage recycling for money and minimalistic ways. Some children have far too much and continue to add to the pile until their room or play room is overflowing with stuff they hardly use. Get rid of it. We always joke with our neighbour that one day our son will be around to pick his weeds and shovel his driveway because we know how much our neighbour hates outdoor chores. His reply, “Send him over”. Whether you are new to a neighbourhood because you just moved in or you have been around for a while get to know your neighbours. You can always suggest your teen to come around and help out with chores outside the house. If you trust your neighbours enough to have your teen help with chores inside the house there are many jobs that can get done that would help a new mom or dad or busy parents. Becoming a mom helper is a great way for a teen to earn hours towards their education and make cash on the side. Another great chore is to take the garbage bins out in time for garbage day and bring them back in once they get back from school. Most people keep their garbage bins outside depending on where they live so they will be easily accessible. There are teens out there that can wrap gifts like angels and they are fast too. Have a look the next time you go to the mall at the wrapping stations and you will see young teens volunteering their time to help make money for a donation centre. If your teen has this skill and you know someone who hates wrapping Christmas gifts have them pay your teen a set amount to wrap them all up. It will save them money from paying someone at the mall to do it. If you do buy from a boutique or certain stores they may wrap your purchase for free but not all shops do this any longer. Another great help to your neighbours or friends might be having your teen help them decorate the house for Christmas or other special holidays. If they don’t have the time and just need a helping hand it may be worth it to pay someone some cash to get the job done quicker without a fuss. First of all finding a quiet spot to chat with your kid about Christmas shopping maybe a coffee shop or public place that is festive in nature might work. Explain that you would love to see your teen participate in a Christmas exchange with his/her friends but that he/she will have to earn the money to go Christmas shopping. Budgeting is a big part of saving money and if your kid has not been introduced to a budget now is a great time to put together a mini budget or wait until they start earning some cash. In the meantime you can teach them how a budget works. Creating a Christmas shopping list according to how much money they are allocating towards gifts is a superior way to teach them money management. Explain to your child any or all the suggestions you have for them to earn some money to go Christmas shopping. Educate your teen about signing up for rewards cards and other programs offered at the stores they shop at but to be aware of how they distribute their personal information. This way they can earn rewards points and redeem them for free stuff throughout the year. You may also want to educate them about targeted shopping practices such as the Scanning Code of Practice and Product Price Adjustments but most of all to always keep and read the receipt. Help your teen the first year and encourage them to venture out on their own the following. Always be there for support and guidance and make sure to let them know to ask for help when they need it. Before you end the conversation you could also discuss where their money will be saved and if you haven’t opened a bank account maybe suggest you both go do that. This will empower them even more when they feel like you trust them to earn money on their own. 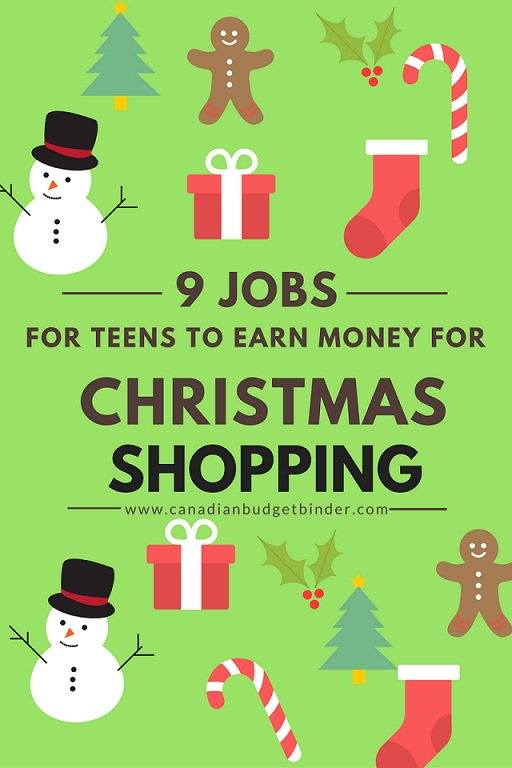 What other ways can teens make money to go Christmas Shopping? When should you put the Christmas lights up? Nice ideas! I am encouraging my sister to apply to a local supermarket because they are in need of staff because it’s Christmas season. Yea, I think it’s a great time to earn some money to make time a bit productive because it’s sem break here in the next few days.